Oh, but there’s a litany of reasons, my dear — all based upon the presumption that you, my sweet, are not opposed to eating chicken — nay, that you even love eating chicken. 1. Roasting a chicken is the easiest way to cook a whole chicken. Very little muss, hardly any fuss. 2. When you roast a whole chicken, as opposed to buying chicken pieces, you save money and anyone that knows me will attest that I am very uncomfortable spending more money than is necessary and somehow this reason #2 has become all about me. Sorry! 3. 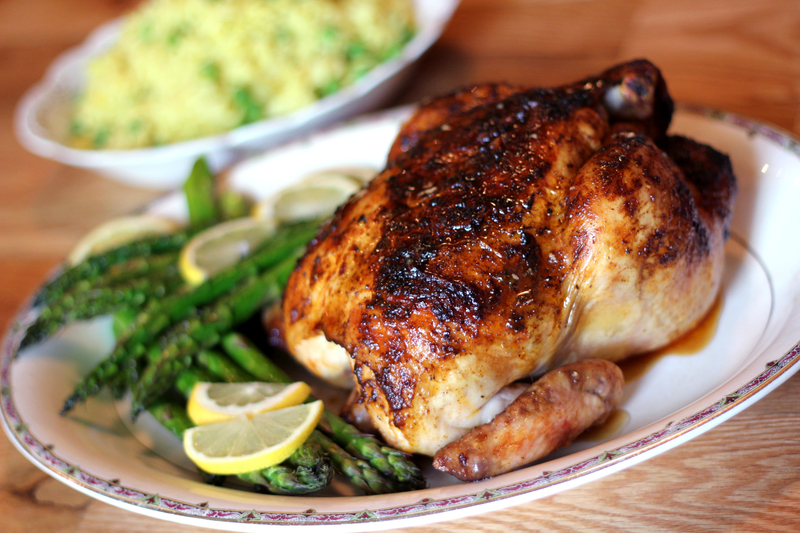 Roasted chicken is a Sunday Supper classic! What better way to welcome a new week than to sit down to a family meal of a beautiful brown chicken, some mashed potatoes or rice pilaf, with collard greens or a lovely zucchini casserole! 4. After you eat the chicken, you can make the most GLORIOUS homemade chicken stock from the bones! It’s better than any you can buy at the store, I swear to you. I could perhaps go on, but you get the picture. Here’s how to do it. How to Roast a Chicken – printable recipe card! Remove the giblets from the chicken if present and pat dry with a paper towel. Put the chicken on top of the onion slices. If using the citrus, squeeze the halves into the cavity of the chicken and throw the rinds in. Put the herbs inside, too. Spread oil or butter all over the outside of the chicken and sprinkle with salt and pepper. Roast for 20 minutes per pound (about 60-80 minutes). Remove when the temperature in the thigh is 175 degrees F or the juices run clear when pierced with a knife. Let rest 15 minutes before carving. Serve with the pan juices. You can also add whole peeled garlic cloves or slices of ginger for a different taste. For an alternate method, see this Spatchcocked Chicken Video!